17/07/1992; Entry into force Date notif. 1. This Directive, which is the eighth individual Directive within the meaning of Article 16 (1) of Directive 89/391/EEC, lays down minimum safety and health requirements for temporary or mobile construction sites, as defined in Article 2 (a). 2. This Directive shall not apply to drilling and extraction in the extractive industries within the meaning of Article 1 (2) of Council Decision 74/326/EEC of 27 June 1974 on the extension of the responsibilities of the Mines Safety and Health Commission to all mineral-extracting industries (12). 3. The provisions of Directive 89/391/EEC are fully applicable to the whole scope referred to in paragraph 1, without prejudice to more stringent and/or specific provisions contained in this Directive. 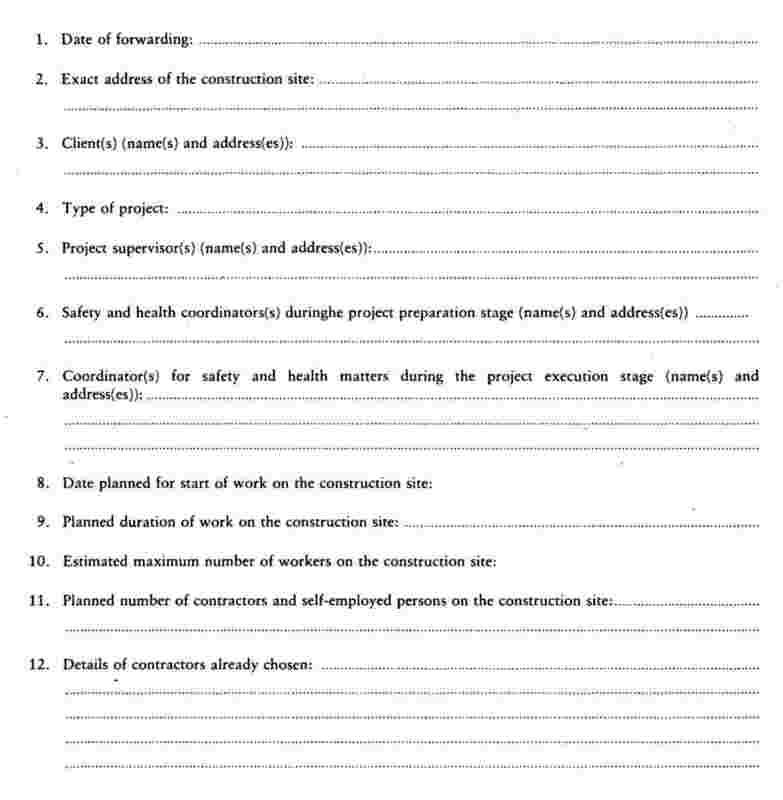 ‘coordinator for safety and health matters at the project execution stage’ means any natural or legal person entrusted by the client and /or project supervisor, during execution of the project, with performing the duties referred to in Article 6.
the client or the project supervisor shall communicate a prior notice drawn up in accordance with Annex III to the competent authorities before work starts. when estimating the period required for completing such work or work stages. Account shall also be taken, each time this appears necessary, of all safety and health plans and of files drawn up in accordance with Article 5 (b) or (c) or adjusted in accordance with Article 6 (c). prepare a file appropriate to the characteristics of the project containing relevant safety and health information to be taken into account during any subsequent works. take the steps necessary to ensure that only authorized person are allowed onto the construction site. interaction with industrial activities at the place within which or in the vicinity of which the construction site is located. take into account directions from the coordinator(s) for safety and health matters. take account of the comments of the coordinator(s) for safety and health. 1. Whitout prejudice to Article 10 of Directive 89/391/EEC, workers and/or their representatives shall be informed of all the measures to be taken concerning their safety and health on the construction site. Consultation and participation of workers and /or of their representatives shall take place in accordance with Article 11 of Directive 89/391/EEC on matters covered by Articles 6, 8 and 9 of this Directive, ensuring whenever necessary proper coordination between workers and/or workers' representatives in undertakings carrying out their activities at the workplace, having regard to the degree of risk and the size of the work site. 1. Amendments to Annexes I, II and III shall be adopted by the Council in accordance with the procedure laid down in Article 118a of the Treaty. 1. Member States shall bring into force the laws, regulations and administrative provisions necessary to comply with this Directive by 31 December 1993 at the latest. 2. When Member States adopt these measures, they shall contain a reference to this Directive or be accompanied by such reference on the occasion of their official publication. The methods of making such a reference shall be laid down by the Member States. 3. Member States shall communicate to the Commission the texts of the provisions of national law which they have already adopted or adopt in the field governed by this Directive. 4. Member States shall report to the Commission every four years on the practical implementation of the provisions of this Directive, indicating the points of view of employers and workers. 5. The Commission shall submit periodically to the European Parliament, the Council and the Economic and Social Committee a report on the implementation of this Directive, taking into account paragraphs 1, 2, 3 and 4. Done at Luxembourg, 24 June 1992. (1) OJ No C 213, 28. 8. 1990, p. 2 and OJ No C 112,27.4. 1991, p. 4. (2) OJ No C 78, 18. 3. 1990, p. 172 and OJ No C 150, 15. 6. 1992. (3) OJ No C 120, 6. 5. 1991, p. 24. (6) OJ No L 393, 30. 12. 1989, p. 13. (7) OJ No L 393, 30. 12. 1989, p. 18. (8) OJ No L 183, 29. 6. 1989, p. 1. (10) OJ No L210, 21. 7. 1989, p. 1. Amended by Commission Decision 90/380/EEC (OJ No L 187, 19. 7. 1990, p. 55). (11) OJ No L 185, 9. 7. 1974, p. 15. Last amended by the 1985 Act of Accession. (12) OJ No L 185, 9. 7. 1974, p. 18. Work which puts workers at risk of burial under earthfalls, engulfment in swampland or falling from a height, where the risk is particularly aggravated by the nature of the work or processes used or by the environment at the place of work or site (1). Work which puts workers at risk from chemical or biological substances constituing a particular danger to the safety and health of workers or involving a legal requirement for health monitoring. Work with ionizing radiation requiring the designation of controlled or supervised areas as defined in Article 20 of Directive 80/836/Euratom (2). Work near high voltage power lines. Work exposing workers to the risk of drowning. Work on wells, underground earthworks and tunnels. Work carried out by drivers having a system of air supply. Work carried out by workers in caisson with a compressed-air atmosphere. (1) In implementing point 1, Member States have the option of setting figures for individual situations. (2) OJ No L 246, 17. 9. 1980, p. 1. Last amended by Directive 84/467/Euratom (OJ No L 265, 5. 10. 1984, p. 4). The obligations laid down in this Annex apply wherever required by the features of the construction site, the activity, the circumstances or a hazard. For the purposes of this Annex, ‘rooms’ covers, inter alia, hutted accommodation. Materials, equipment and, more generally, any component which, when moving in any way, may affect the safety and health of workers must be stabilized in an appropriate and safe manner. Access to any surface involving insufficiently resistant materials is not authorized unless appropriate equipment or means are provided to enable the work to be carried out safely. The installations must be designed, constructed and used so as not to present a fire or explosion hazard; persons must be adequately protected against the risk of electrocution caused by direct or indirect contact. The design, construction and choice of equipment and protection devices must take account of the type and power of the energy distributed, external conditions and the competence of persons with access to parts of the installation. Emergency routes and exits must remain clear and lead as directly as possible to a safe area. The number, distribution and dimensions of emergency routes and exits depend on the use, equipment and dimensions of the site and of the rooms and the maximum number of persons that may be present. Specific emergency routes and exits must be indicated by signs in accordance with the national regulations implementing Directive 77/576/EEC (1). Such signs must be sufficiently resistant and be placed at appropriate points. Emergency routes and exits, and the traffic routes and doors giving access to them, must be free from obstruction so that they can be used at any time without hindrance. Depending of the characteristics of the site, the dimensions and use of the rooms, the on-site equipment, the physical and chemical properties of the substances present and the maximum potential number of people present, an adequate number of appropriate fire-fighting devices and, where required, fire detectors and alarm systems must be provided. These fire-fighting devices, fire detectors and alarm systems must be regularly checked and maintained. Appropriate tests and drills must take place at regular intervals. Non-automatic fire-fighting equipment be easily accessible and simple to use. The equipment must be indicated by signs in accordance with the national regulations implementing Directive 77/576/EEC. Such signs must be sufficiently resistant and placed at appropriate points. Steps shall be taken to ensure that there is sufficient fresh air, having regard to the working methods used and the physical demands placed on the workers. If a forced ventilation system is used, it must be maintained in working order and must not expose workers to draughts which are harmful to health. Workers must not be exposed to harmful levels of noise or to harmful external influences (e.g. gases, vapours, dust). If workers have to enter an area where the atmosphere is liable to contain a toxic or harmful substance or to have an insufficient oxygen level or to be inflammable, the confined atmosphere must be monitored and appropriate steps taken to prevent any hazards. A worker may not in any circumstances be exposed to a high-risk confined atmosphere. He must at least be watched at all times from outside and all appropriate precautions must be taken to ensure that he can be assisted effectively and immediately. During working hours, the temperature must be appropriate for human beings, having regard to the working methods used and the physical demands placed on the workers. Workstations, rooms and traffic routes must as far as possible have sufficient natural lighting and be provided with appropriate and sufficient artificial lighting at night and when natural daylight is inadequate; where necessary, portable light sources that are protected against impact must be used. The colour of artificial light used must not alter or affect the perception of signals or signposts. Lighting installations for rooms, workstations and traffic routes must be placed in such a way that there is no risk of accident to workers as a result of the type of lighting fitted. Rooms, workstations and traffic routes where workers are especially exposed to risks in the event of artificial lighting must be provided with emergency lighting of adequate intensity. Sliding doors must be fitted with a safety device to prevent them from being derailed and falling over. Doors and gates opening upwards must be fitted with a mechanism to secure them against falling back. Doors and gates along escape routes must be appropriately marked. In the immediate vicinity of gates intended primarily for vehicle traffic, there must be doors for pedestrian traffic unless it is safe for pedestrians to cross; such doors must be clearly marked and kept free at all times. Mechanical doors and gates must operate without any risk of accident to workers. They must be fitted with emergency stop devices which are easily identifiable and accessible and, unless they open automaticially in the event of a power-cut, it must be possible for them to be opened manually. Traffic routes, including stairs, fixed ladders and loading bays and ramps, must be calculated, located, laid out and made negotiable to ensure easy, safe and appropriate access in such a way as not to endanger workers employed in the vicinity of these traffic routes. Routes used for pedestrian traffic and/or goods traffic including those used for loading and unloading must be dimensioned in accordance with the number of potential users and the type of activity concerned. If means of transport are used on traffic routes, a sufficient safety clearance or adequate protective devices must be provided for other site users. Routes must be clearly marked, regularly checked and properly maintained. If the site includes limited-access areas, these must be equipped with devices to prevent unauthorized workers from entering. Appropriate measures must be taken to protect workers who are authorized to enter the danger areas. Danger areas must be clearly signposted. Loading bays and ramps must be suitable for the dimensions of the loads to be transported. Loading bays must have at least one exit point. Loading ramps must be sufficiently safe to prevent workers from falling off. The floor area at the workstation must be such as to allow workers sufficient freedom of movement to perform their work, taking account of any necessary equipment or applicances present. The employer must ensure that first aid can be provided, and that the staff trained to provide it can be called upon, at any time. Measures must be taken to ensure that workers who have had an accident or have suddenly been taken ill can be removed for medical treatment. One or more first-aid rooms must be provided where the scale of the works or the types of activity being carried out so require. They must be signposted in accordance with the national regulations implementing Directive 77/576/EEC. In addition, first-aid equipment must be available at all places where working conditions so require. This equipment must be suitably marked and easily accesible. The address and telephone number of the local emergency service must be clearly displayed. 14.1. Changing rooms and lockers. Appropriate changing rooms must be provided for workers if they have to wear special work clothes and if, for reasons of health or propriety, they cannot be expected to change in another area. Changing rooms must be sufficiently large and have facilities to enable each worker, where necessary, to dry his working clothes as well as his own clothing and personal effects and to lock them away. If circumstances so require (e.g. dagerous substances, humidity, dirt), facilities must be provided to enable working clothes to be kept in a place separate from workers' own clothes and personal effects. Provisions must be made for separate changing rooms or separate use of changing rooms for men and women. If changing rooms are not required as referred to in point 14.1.1, first paragraph, each worker must be provided with a place in which he can lock away his own clothes and personal effects. Suitable showers in sufficient numbers must be provided for workers if required by the nature of the work or for health reasons. Provisions must be made for separate shower rooms or separate use of shower rooms for men and women. The showers must be equipped with hot and cold running water. Where showers are not required under the first paragraph of 14.2.1, a sufficient number of suitable washbasins with running water (hot water if necessary) must be provided in the vicinity of the workstations and the changing rooms. Provisions must be made for separate washbasins, or separate use of washbasins for men and women when so required for reasons of propriety. Where the rooms housing, the showers or washbasins are separate from the changing rooms, there must be easy communication between the two. Special facilities with an adequate number of lavatories and washbasins must be provided for workers in the vicinity of workstations, rest rooms, changing rooms and rooms housing showers or washbasins. Provisions must be made for separate lavatories or separate use of lavatories for mens and women. Where the safety or health of workers, in particular because of the type of activity carried out or the presence of more than a certain number of employees as well as the remote nature of the site, so require, workers must be provided with easily accessible rest rooms and/or accommodation areas. Rest rooms and/or accommodation areas must be large enough and equipped with an adequate number of tables and seats with backs for the number of workers concerned. If there are no facilities of this kind, other facilities must be provided in which workers can stay during interruptions in work. Fixed accommodation areas unless used only in exceptional cases, must have sufificient sanitary equipment, a rest room and a leisure room. They must be equipped with beds, cupboards, tables and seats with backs taking account of the number of workers, and be allocated taking account, where appropriate, of the presence of workers of both sexes. Appropriate measures should be taken for the protection of non-smokers against discomfort caused by tobacco smoke in rest rooms and/or accommodation areas. Workplaces must be organized to take account of handicapped workers, if necessary. The provision applies in particular to the doors, passageways, staircases, showers, washbasins, lavatories and workstations used or occupied directly by handicapped persons. The surroundings and the perimeter of the site must be signposted and laid out so as to be clearly visible and identifiable. Workers must be provided at the site with a sufficient quantity of drinking water and possibly another suitable non-alcoholic beverage both in occupied rooms and in the vicinity of workstations. where appropriate, be provided with facilities enabling them to prepare their meals in satisfactory conditions. If special situations so dictate, the classification of these minimum requirements into two sections, as below, should not regarded as binding. Premises must have a structure and stability appropriate to the nature of their use. Emergency doors must not be so locked or fastened that they cannot be easily and immediately opened by any person who may require to use them in an emergency. Sliding or revolving doors are not permitted if intended as emergency exits. The temperature in rest areas, rooms for duty staff, sanitary facilities, canteens and first-aid rooms must be appropriate to the particular purpose of such areas. Windows, skylights and glass partitions should allow excessive effects of sunlight to be avoided, having regard to the nature of the work and the use of the room. Workplaces must as far as possible have sufficient natural light and be equipped with the means of providing artificial lighting which is adequate for the purposes of protecting workers' safety and health. It must be possible for workers to open, close, adjust or secure windows, skylights and ventilators in a safe manner. When open, they must not be positioned so as to constitute a hazard to workers. Windows and skylights must be designed in conjunction with equipment or otherwise fitted with devices allowing them to be cleaned without risk to the workers carrying out this work or to workers present. The position, number nad dimensions of doors and gates, and the materials used in their construction, are determined by the nature and use of the rooms or areas. Transparent doors must be appropriately marked at a conspicious level. Where the use and equipment of rooms so requires for the protection of workers, traffic routes must be clearly identified. Escalators and travelators must function safely. They must be equipped with any necessary safety devices. They must be fitted with easily identifiable and accessible emergency shut-down devices. Workrooms must have sufficient surface area and height to allow workers to perform their work without risk to their safety, health or well-being. the outside influcences to which they may be subject. If the support and the other components of these workstations are not intrinsically stable, their stability will have to be ensured by appropriate and safe methods of fixing to avoid any untimely or spontaneous movement of the whole or of parts of the workstations. Stability and solidity must be checked appropriately and especially after any change in the heigt or depth of the workstation. On-site energy distribution installations, especially those subject to outside influences, must be regularly checked and maintained. Installations existing before the site began must be identified, checked and clearly signposted. Whenever possible, where overhead electric power lines exist, either they must be redirected away from the area of the site or else the current must be cut off. If this is not possible, there will be barriers or notices to ensure that vehicles and installations are kept away. Suitable warnings and suspended protections must be provided where vehicles have to pass beneath the lines. Workers must be protected against atmospheric influences which could affect their health and safety. Wherever technically feasible, workers must be protected by collective methods against falling objects. Materials and equipment must be laid out or stracked in such a way as to prevent their collapsing or overturning. Where necessary, there must be covered passageways on the side or access to danger areas must be made impossible. Falls from a height must be physically prevented in particular by means of solid cradles which are sufficiently high and have at least an end-board, a main handrail and an intermediate handrail or an equivalent alternative. In principle, work at a height must be carried out only with appropriate equipment or using collective protection devices such as cradles, platforms or safety nets. If the use of such equipment is not possible because of the nature of the work, suitable means of access must be provided and safety harnesses or other anchoring safety methods must be used. All scaffolding must be properly designed, constructed and maintained to ensure that it does not collapse or move accidentally. Work platforms, gangways and scaffolding stairways msut be constructed, dimensioned, protected and used in such a way as to prevent people from falling or being exposed to falling objects. after any modification period without use, exposure to bad weather or seismic tremors, or any other circumstance which may have affected its strength or stability. Ladders must be sufficiently strong and correctly maintained. They must be correctly used, in appropriate places and in accordance with their intended purpose. Mobile scaffolding must be secured against spontaneous movements. operated by qualified workers who have received appropriate training. All lifting devices and acccesories must clearly display their maximum load values. Lifting equipment and accessories may not be used for other than their intended purposes. Drivers and operators of excavating and materials-handling vehicles and machinery must be specially trained. Preventive measures must be taken to ensure that excavating and materials-handling vehicles and machinery do not fall into the excavations or into water. Where appropriate, excavating machinery and materials-handling machinery must be fitted with structures to protect the driver against being crushed if the machine overturns, and against falling objects. operated by workers who have received appropriate training. Installations and equipment under pressure must be checked and subjected to regular tests and inspections in accordance with existing legislation. to enable workers to reach safety in the event of fire or inrush fo water or materials. Before excavation starts, measures must be taken to identify and reduce to a minimum any hazard due to underground cables and other distribution systems. Safe routes into and out of the excavation must be provided. Piles of earth, materials and moving vehicles must be kept away from the excavation; appropriate barriers must be built if necessary. the work must be planned and undertaken only under the supervision of a competent person. Metal or concrete frameworks and their components, shutterings, prefabricated components or temporary support, and buttresses must be erected and dismantled only under the supervision of a competent person. Adequate precautions must be taken to protect workers against risks arising from the temporary fragility or instability of a structure. Shutterings, temporary supports and buttresses must de devises and designed, installed and maintained so as to safely withstand any strains and stresses which may be placed on them. appropriately equipped so that workers can gain shelter in the event of an irruption of water and materials. The construction, installation, transformation or dismantling of a cofferdam or caisson must take place only under the supervision of a competent person. All cofferdams and caissons must be inspected by a competent person at regular intervals. Where necessary to avert a risk or where the height or the slope exceed values set by the Member States, collective preventive measures must be taken to prevent workers, and tools or other objects or materials, from falling. Where workers have to work on or near a roof or any other surface made of fragile materials through which it is possible to fall, preventive measures must be taken to ensure that they do not inadvertently walk on the surface made of fragile materials, or fall to the ground. (1) OJ No L 229, 7. 9. 1977, p. 12. Last amended by Directive 79/640/EEC (OJ No L 183, 19. 7. 1979, p. 1). (2) This point will be specified in the framework of the future Directive amending Directive 89/655/EEC, particularly with a view to supplementing point 3 of the Annex thereto. (3) This point will be specified in the framework of the future Directive amending Directive 89/655/EEC, particularly with a view to supplementing point 3 of the Annex thereto.